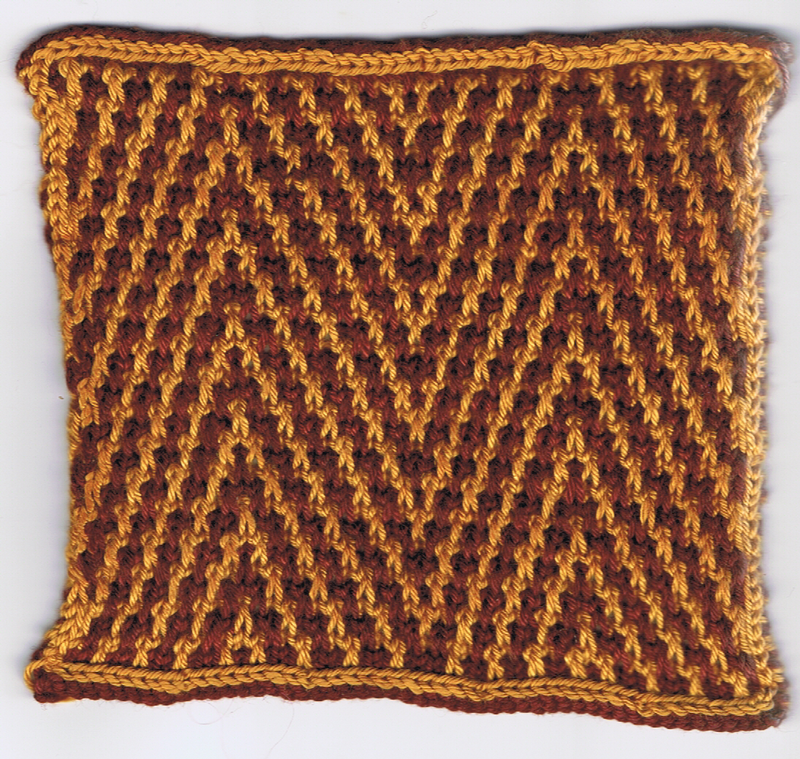 The Zebra Chevron Slip-Stitch Colourwork pattern is one of my favourite stitch patterns, and it’s surprisingly easy to work. 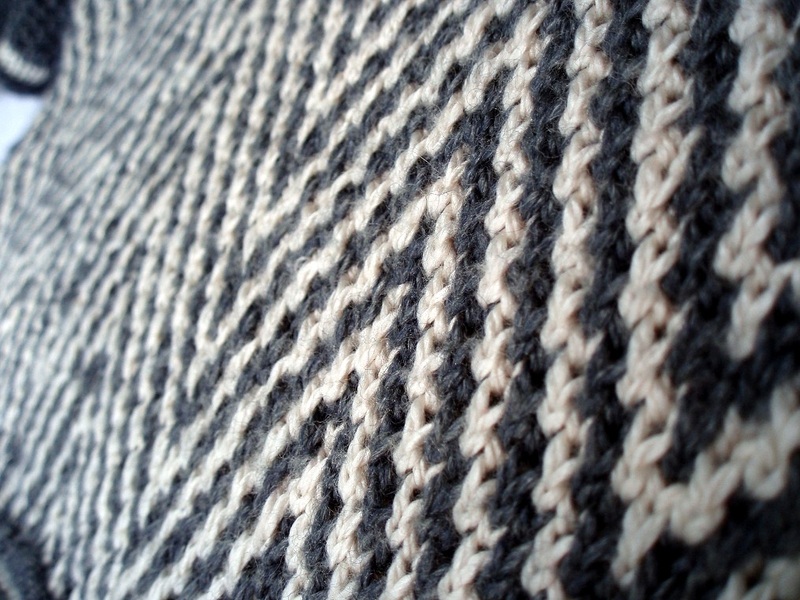 I think you’ll agree it makes for a striking pattern, and all it is is stripes of knit sts with a few slip stitches thrown in. 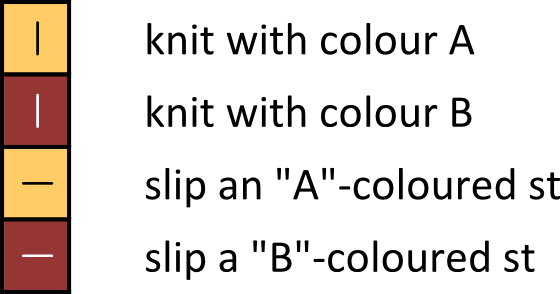 To work this st, you work in stripes of colours, knitting 1 to 3 sts in the colour you are using this stripe, and slipping sts that you want to leave in the contrasting colour. Always slip purlwise, so no twist is introduced into the st.
Rnds 1 & 2: With colour A, [k2, sl1] 8 times. Rnds 3 & 4: With colour B, [sl1, k2] 3 times, sl1, k3, [sl1, k2] 3 times, sl1, k1. Rnds 5 & 6: With A, k1, sl1, [k2, sl1] 3 times, k1, sl1, [k2, sl1] 3 times, k2. Rnds 7 & 8: With B, repeat Rows 1 & 2. Rnds 9 & 10: With A, repeat Rows 3 & 4. Rnds 11 & 12: With B, repeat Rows 5 & 6. To knit it flat, work the odd rows as written, and then for the even rows, just slip (wyif) the slip sts and purl the knit sts of the previous row. 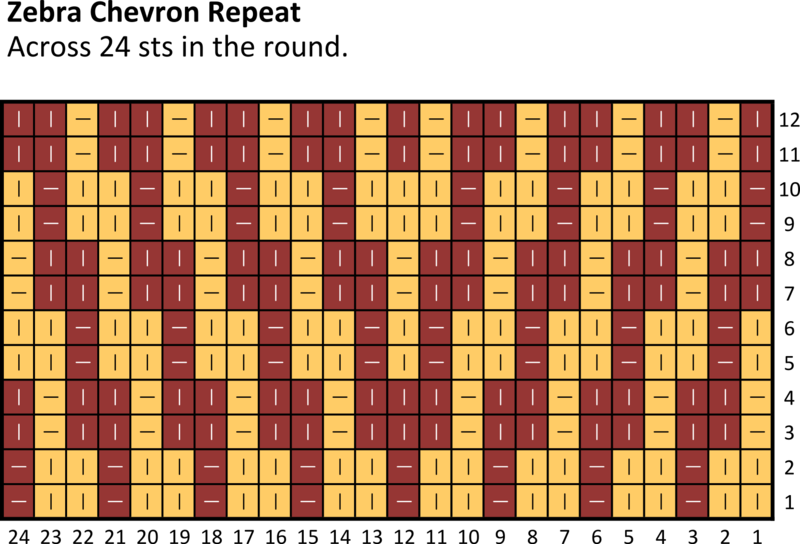 The fabric produced when working a mosaic or slip-stitch pattern is much denser than plain stocking st. This is because you’re effectively working every row twice; once with each colour. The fabric is firmer, with less stretch, but it’s warmer too.